There’s no doubt that one of the very coolest accessories for any smartphone in the world today is the Palm Touchstone Charging Dock pictured above – a small base and battery cover that allows you to charge your new Palm Pre wirelessly (without the need to have a physical cable directly plugged into your device) and which even iPhoniacs crave. Strong magnets on the Touchstone Dock combined with small metal plates built into the Palm Touchstone Back Cover (included as part of the kit) ensure that your Pre is securely attached to the base at all times (you can turn your Touchstone upside down and the Pre will still hold on). I haven’t decided exactly where I’ll position the Touchstone in my car yet but it will be either on the dashboard (using velcro or industrial strength double sided tape) or somewhere in my center console (where my 12–Volt adapter is actually located). 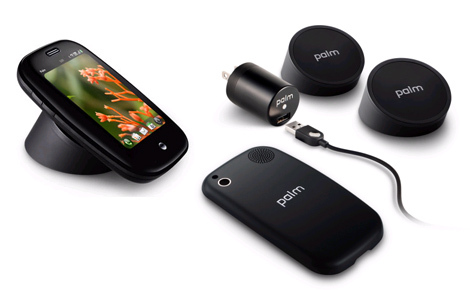 Ideally though, I would like to see Palm come out with a specially designed Touchstone for the car at some point in the future. 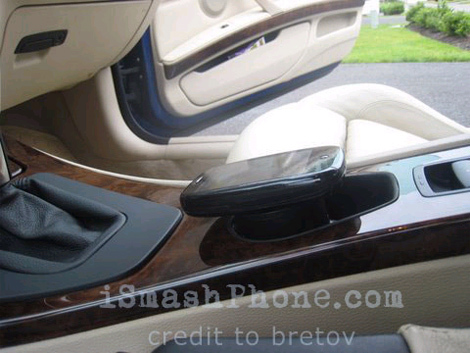 Another determined Preonaut actually wanted an even “cleaner” in-car Pre charging solution – one that would show no wires and that would fit seamlessly in his center console so he mounted a Touchstone on the center console of his BMW (2008 335 convertible pictured above) and ran a Sprint car charger with a mini-USB connector from the Touchstone to the car's electrical system. The above setup will clearly not work well if you’re planning to rely on the built-in GPS navigation capabilities of your Palm Pre (where you need to have the device in front of you) but if all you want to is to have an elegant and discrete solution to simply charge your smartphone without having to regularly plug and unplug wires then I can’t think of a better option. Also, if you have already tested the Touchstone in your car and it works please let your fellow Preonauts know what car and model you have via the comments link below. *Whew* I'm glad that's settled. Some people just couldn't take the hint that they are *very* immature and narrow-minded. In any case, I've noticed that the Pre keeps displaying every 10 minutes or so that it is charging.. after the battery hits 100% full. Does this mean I can't leave the Pre charging on the touchstone for the rest of the day? Wow! can't believe ppl are trying to say this isn't "wireless" it is clearly wireless for the simple fact that you plug absolutely "nothing" into your palm pre device. The touchstone itself makes absolutely NO connection either through plugs or wires to the device. It charges by an neat technology call "induction" basically electrons traveling around a coil inside the touchstone through magnetic force moves electrons in a coil located on the back of the special backplate you get..... moving electrons = electricity ... Novel concept isn't it! Technically speaking it would be very easy for other phone manufacturers to build this feature into their phones and make their own induction chargers....its a very simple concept and you can actually engineer something similar at home using a 2 wire coils, source of electricity and something that needs electricity however regulating voltage and amps will be a problem. It is looking really good car stand for pro. It is looking really cool. Palm Touchstone For Pre In Car is a Interesting Things. This increases the chances of being more Reliable with car. I appreciate you for this. In these blog there are so many things which is really very great and one of the great functionality these all things are cool to know about it.